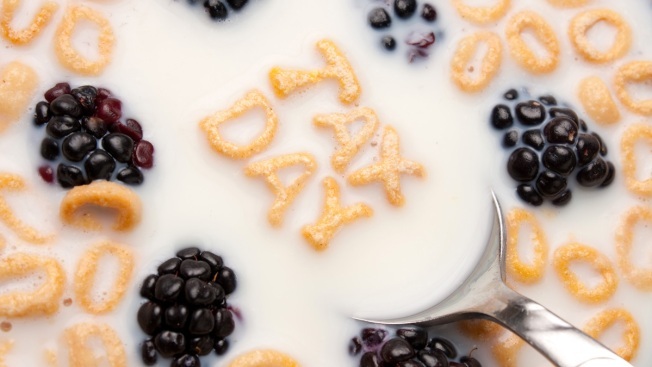 The words TAX DAY spelled out of letter shaped cereal pieces floating in a milk filled cereal bowl. For many people besides IRS employees, Tax Day is usually a total drag. Plenty of Americans scramble to file by the April 15 deadline, and the sheer stress of it all can be enough to make the whole month feel a little gloomy. Luckily, food chains across the nation feel filers' pain and have great ways of helping patrons cope with those Tax Day woes. From massive margaritas to sweet deals on southern food, here are 15 Tax Day food deals and freebies. The Dollarita, Applebee’s $1 deal on classic margaritas, is back this month. April's version of the discounted drink is served with strawberry Twizzlers straws that will put folks in a playful mood — even after paying their taxes. From Wednesday, April 10 through Monday, April 15, Boston Market will offer dine-in guests the "Tax Day Meal Special." It’s a Half Chicken Individual Meal with two sides, cornbread and a regular fountain beverage. The deal is available at all of its 450-plus locations nationwide. The Tax Day Special costs $10.40 (the number that marks an individual filing form), which shaves $2 off the meal's usual cost. On Tax Day, all customers can score free chips and queso by saying "1040" at checkout (this whole 1040-thing is becoming a trend). The chain has locations in Connecticut, Delaware, Florida, Maryland, New Jersey, Pennsylvania, Virginia, West Virginia and Washington D.C. Nothing says so long to Tax Day like endless pizza. Cicis' unlimited buffet costs only $4.15 on April 15 (that's 4/15) with the purchase of a large drink. Customers must present this coupon to redeem the deal. From April 15 to April 17, dine-in customers at the Corner Bakery will be able to enjoy a buy-one-get-one deal and claim two entrees for $10.40. 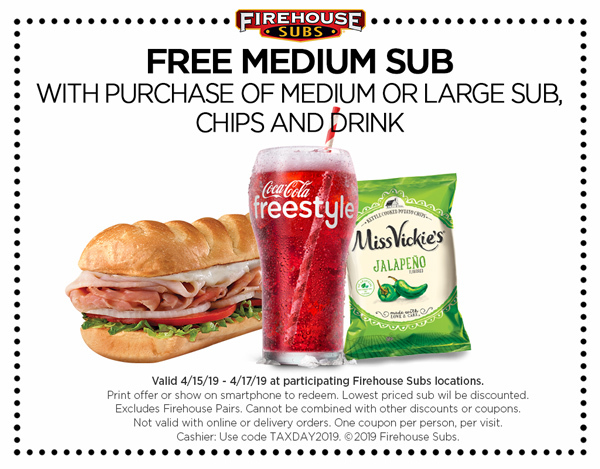 Customers who buy a medium or large sub, chips and a drink will get a second medium-sized sandwich for free at Firehouse Subs. The offer is valid from April 15 through April 17. Customers will need to present this exclusive coupon to redeem the offer. Stop into any participating Great American Cookies location on Tax Day and walk away with a free chocolate chip cookie. The cookie shop, with nearly 300 stores nationwide, marks Tax Day with a free cookie giveaway every April. Hardee’s will help taxpayers rise and shine with one free sausage biscuit on April 15 from 7 a.m. to 10 a.m. at participating stores. Customers must say "made from scratch" in order to unlock the Tax Day freebie. There’s a limit of one biscuit per customer, so don’t plan on hosting a biscuit potluck later in the day. Shake off that Tax Day stress with a corn dog. Stop into any participating Hot Dog on a Stick shop for one free turkey or veggie dog on April 15. There’s a limit of one dog per customer, but no purchase is required. Clearly, the chain is hoping to drag people out of their dog day moods. From April 12 through April 15, kids (or "dependents," if we're talking taxes) can eat free at Hooters with any $15 adult purchase. Bring on the curly fries and boneless wings! Kona Ice has renamed Tax Day as National "Chill Out Day" at its shops. Stop by the company’s island-inspired trucks on April 15 for a free cup of tropical shaved ice. The shaved ice deal varies from truck to truck, but the company has over 600 franchise locations in 43 states. Visit the chain’s website for participating hours. West Coast pizza chain Mountain Mike’s is giving taxpayers two big reasons to celebrate the dreaded filing deadline. Get $3 off any large pizza pie using the coupon code 481658. Or get $8 off any two large pies using the code 883457. Potbelly Sandwich Shop is offering buy-one-get-one free sandwiches. When you buy one sandwich, you get one sandwich of equal or lesser value free. Just mention those two little words ("Tax Day") to redeem the deal at checkout on April 15. Head on over to one of Schlotzsky’s 350 locations on Tax Day for a free, small original sandwich (valued at $4.99) with the purchase of chips and a medium drink, which will set you back about $3.75. Earn $2 off any 20-ounce smoothie at Smoothie King by using Smoothie King's Healthy Rewards app. The offer will be available starting April 15 and remain valid through April 18, just long enough to carry you through the bitter end of the filing period.